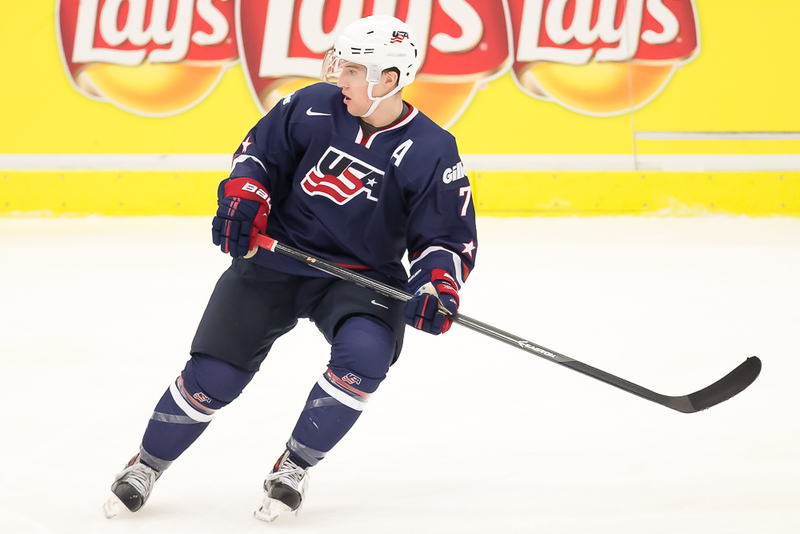 After taking a look at the U.S. National Junior Team as a whole and detailing the play of the forwards, it’s time to close the book on the 2014 World Juniors with the final looks at Team USA’s defense and goaltending. After coverage that dates back to June when the initial summer evaluation camp roster was named, this is the last piece on the tournament. It’s always bittersweet when the coverage of one tournament ends, but with the Olympics on the horizon, there is plenty to look forward to in international hockey. 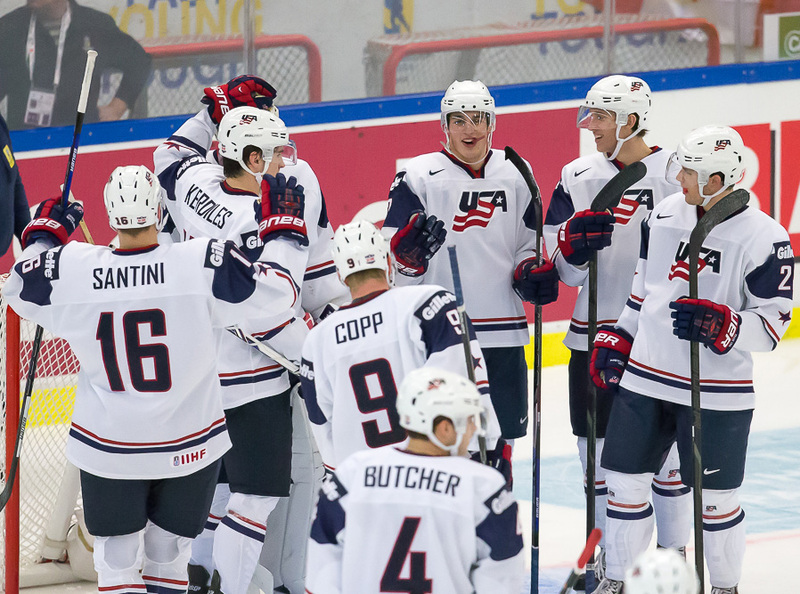 When it came to the 2014 U.S. National Junior Team, they had to find a way to make up for the losses of three defensemen from last year’s team that were eligible to return. Guys like Jacob Trouba and Seth Jones, currently plying their trade in the NHL, are irreplaceable. Meanwhile, Patrick Sieloff, still recovering from a staph infection, would have brought some great leadership and solid shutdown minutes to the roster. Team USA counteracted those significant losses by building a very balanced defense corps that allowed for versatility in the lineup and had enough talent to roll the pairings throughout the tournament regardless of opponent. The goaltending was an expected strength for Team USA coming into the tournament with Jon Gillies and Anthony Stolarz the top goaltenders in their respective leagues. Gillies ended up taking the reins and was dealt a mix of bad luck and allowed a few ill-timed rebounds that blemished his tournament a bit. Even with a few miscues, it’s hard to hang the early exit on goaltending. Coming up after the jump, a look at Team USA’s defense and goaltending. Players listed in alphabetical order. Draft rights in parenthesis, tournament stats after each capsule. Thatcher Demko (2014) — Demko did not dress in a game for Team USA as the third-stringer. He will be eligible to return to the team next year and is the likely front runner to start. Even though he didn’t play, there’s a lot that can be learned in that role. Demko might not have enjoyed spending Christmas and New Year’s collecting dust, but his being in the building and watching the tournament and being around the team will help him prepare for what is likely his net next year. That’s it for the 2014 World Junior Championship. Thanks again for following along and checking out the site. I will have some Olympic coverage here, but the bulk of my work on Sochi is going to be found at CBSSports.com’s Eye On Hockey Blog. Hope you’ll check that out as well. Thanks again for sticking with the coverage throughout and I wish you a happy and healthy 2014. Thank you Chris for once again fulfilling all expectations in your reporting of the World Juniors. Great job with the WJC coverage! Our hinge point, Chris was clearly the Canada loss. Inasmuch, if you had access to the Canadian/TSN commentators, both colorman Ray Ferraro and Bob McKenzie (between period, post-game analysis) paid great praise to our boys’ style of play. It was quite evident, at least for the first half of the 3-2 loss, that Team’s USA east-west game far exceeded the Canadian’s. We appeared more capable in transitioning from D to O; our passes were consistently crisp, tape-to-tape; and, moreover, Team USA seemed the better coached if not better prepared side. Had Team USA converted one or both of the two breakaway opportunities against the Canadian goalkeeper, a superb Zach Furcale, this narrative might be cast in a whole different light.